Lest I have not made it clear already OSA North Brooklyn has a suspicious provenance, has been less than forthcoming about their mission (to put it politely) and how they are spending the money our elected officials (READ: our tax dollars) have donated to them. 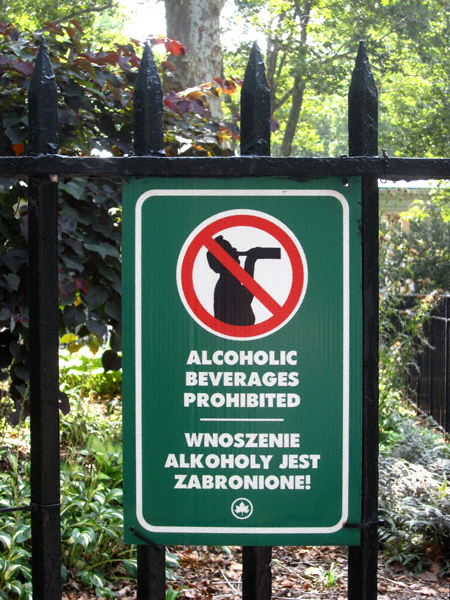 when the patrons of McGolrick Park are admonished to abstain: in English and Polish. I suppose the “open container law” applies to some citizens more than others. Or as long as folks are swilling booze sanctioned by/profiting the city (or OSA)? Remember, the President of Brooklyn Brewery is one of their founding members) I suppose it’s A-OK? Can you say hypocrisy? This whole set-up reeks of graft. and cries “poverty” when it comes a new fence at the McCarren Park Dog Run. McGolrick gets a new fence and McCarren gets Sternberg’s leftovers. 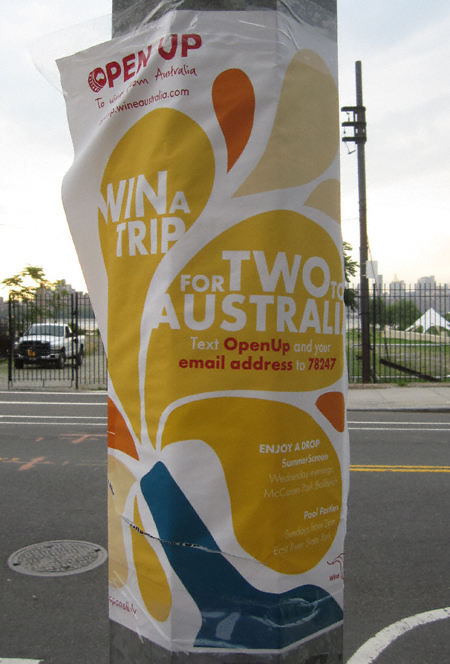 I could not understand why this came to pass— McCarren needs help. BIG TIME. Then I remembered that I am (for all intents and purposes) an honest person. I put on my “tweeder” thinking cap and re-read this exchange. Being Ms. Thayer’s little brother. If a Parks employee/OSA Executive has sent an email indicating her own brother should be compensated $100 for doing no work whatsoever how many more of her friends are on the dole? Just a question. UPDATE, 7/30/09: Be sure to read the comments. Suffice it to say it keeps getting more and more interesting! …Currently, the fencing surrounding the McCarren Park dog run is a combination of chain-link fence, temporary wire barriers and historical black iron fencing the iron fencing makes up nearly three quarters of the hodge-podge partition. Recently the Park’s Department decided to standardize the fences in Sternberg Park as well, and in doing so uprooted a portion of black iron fencing, which will in turn be installed in McCarren, to match the already existing iron fencing stock. Actually Diana Reyna gave $40,000 to Sternberg to buy a new fence. It IS an election year after all. Found the words. I’m part of the community committee. When i voted for the $500.00 dollars to go toward the McCarren Dog Run, I thought it was going to the run. Who are “the leaders”? Sorry about that, I pressed submit before I was ready. Was she referring to leaders of the dog run or leaders of a team of workers? If you read the letter closely, it could be saying that the donation to the dog run is to thank volunteers for their time but the money is going to the dog run. It isn’t totally clear that these anonymous folks are getting cash in their pockets. It isn’t clear they aren’t, either, though. Given that Greg made a $100 contribution to Evan Thies’s campaign (who it should be noted has received a significant number of contributions from OSA members) and was awarded $100 by OSA for doing no work whatsoever— I am very suspicious. For the record, Mark, who owns the house in the state park let me and my friend Suzanne hang the banner, for free for two weeks. We are very thankful that Mark believes in OSA’s mission and that he was so generous is his donation of space. It’s just too bad Suzanne and I didn’t realize the slant of the roof until we hard carried four 50lb. sand bags up four flights of stairs… and mounted the 40lb. banner. 1. Mark may not be legally entitled to hang this advertisement on his property. 2. The money OSA spent on this advertisement could have been spent on something else— say, for example: parks. Regarding alcohol–basically the only way you can have alcohol in any parks in NYC is if it’s in an enclosed area and you have a permit. If the gentlemen in McGolrick get themselves a VIP tent and shell out some money for the application fee, they’re golden. In all seriousness could you explain the application process in layman’s terms? For starters, what agency/entity handles them? I am a frequent reader of your blog and have been for a few years. I am a parks activist in the community so I’ve found it interesting to watch your commentary on our projects. At the last OSA community committee, your name was on the invited persons role call but you were not present. I think you are right to be concerned with these community issues and the politics behind them– but much of that concern is moot if you don’t show up to represent your concerns in person. This post shows that the costs involved with Parks, managing parks, and park events aren’t really understood. Possibly we should put on a seminar for people who would like to understand more about how to have an event, drinking, etc., and the costs that have to be considered when repairing things in parks to help those who haven’t gotten involved understand. Much of what you are coloring as injustices are just simply ways of moving forward and temporary solutions that are a step towards long term. For example, McCarren has a historic fence that is very expensive to replicate and the community committee agreed that the dog fencing match the other fencing. McGorlick had nothing to match to. Also, the dog run grants sat around for years until OSA pulled it up to be used. Grants expire, and that one was about to, so it was paramount to use it before it expired. But my question is– if we took an opportunity to have an educational seminar on how Parks bureaucracy and policies work, would you show up? Your attendance record is not great when you’re invited. But then you complain when you’re not. I’m not sure if your public is aware of that aspect of your commentary. The next community committee meeting is on 17th of August. I look forward to meeting you. The reason I did not and do not attend these meetings is because I want no part of OSA or the “friends of” groups here. This is not to suggest I am not for parks or open space— I am. But I want nothing to do with entities that do business with developers (FOR EXAMPLE: Dean Palin and the India Street mural). 1. The serious conflict of interest posed by having a parks advocate who is also a city employee. What is the process for getting an alcohol permit for an event in a park? Basically you have to go to the parks dept website and do an event permit application. Then if you are planning to charge money or have alcohol, there are permits on top of that–special use applications. I did all of this to have an event at Grand Ferry Park, it was not that hard. We also had to get a sound permit from the precinct, and permission from the city to block off the street. 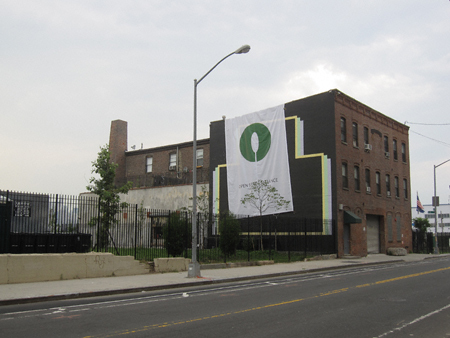 Heather, did you know that OSA is modeled on the Prospect Park Alliance? It’s my understanding that the head of PPA, Tupper Thomas is also paid half by parks and half by the Alliance. I don’t know how that community feels that the model has worked out–obviously there are major differences in their situation and ours (they have a higher-income community for one thing), but I think an enterprising journalist or blogger out there might want to talk to Tupper, who is their “Stephanie” on how things have worked over there, as well as community parks advocates about their relationship with PPA. They do have a dang nice park. Did you get your high horse at Ralph Lauren or Banana Republic? -How Stephanie’s role should be balanced. There is a general air of conspiracy and corruption in your reporting. In the end it turned out you just didn’t understand the logic behind some issues which were easily clarified. That’s what leads me to believe that your interest is in gossip and not so much in finding solutions. Showing up, asking questions to people who know the answers and being a participant would lead to solutions, or at least be productive. Granted your readership is much higher than blogs that report in a very balanced, researched way– I suppose it’s our human nature that makes us crave drama, even if it’s created. I am concerned because there is a lot of anger in the community that, through clear and researched communication, would be clarified. We have so many people who are upset and hateful, and so few people that come out, volunteer, create events, and actually work for change. When there is gossip and backbiting and hate, much fueled by posts like this, it drives away the honest people who are getting things done because they don’t want to be in a negative, critical environment. I would love to help you with fundraisers or park events that would inspire you. The parks are there for everyone to use, and they are governed by certain laws to keep things fair and safe for everyone. Whatever you could imagine to do, through proper permits can be done, basically. no no: i got my high horse from Minor Threat, Fugazi and the Situationists. McGorlick = $5,000 from OSA + professionally installed fencing + included in the November 08 meeting + fencing completed + used by several hundred dog owners each week. McCarren = $500 + asked to find volunteer welder + welder solicited by OSA + welder assistant solicited by OSA + not invited to November 08 meeting + fencing not done + used by nearly 1000 dog owners each week. Does it look differently? Why is a park that is used by less people getting more money? Why is one being asked to used volunteers and the other used professionals? Everybody play nice! 😉 That said, if anyone from the Parks Department/OSA would like to educate us about the funding process, address any “issues” he (or she) might have with the content of this web site or even refute its content he (or she) is more than welcome to post a comment. Provided it is not abusive to yours truly or fellow commenters I will approve it. …oh yeah, thanks for clarifying the permit issue, Mikki. I really appreciate it! Lest I have not made it clear already, greenjeans, I want no affiliation with OSA/NYC Parks Department. Therefore your offer is moot. Thanks anyway. If/when I initiate a community garden I’ll contact you. … you have a starving population, an absentee aristocracy, and an alien church, and in addition the weakest executive in the world. That is the Irish Question. Peter “Pete” McGuinness, whose boulevard I am certain you are familiar with, was the driving force behind the McCarren Park Pool’s construction. He was the child of Irish immigrants. Who came to America as a result of Disreali’s “Irish Question”. One which Great Britain did not want to answer. Disraeli also thought Queen Victoria should be Empress of India. Disraeli was a bona fide colonialist. In this respect I find your quote very prescient: $3,000 is the only thing that separates “the community” from being on OSAnb’s “Board”. And separates it does: no one I know in my community has $3,000 to outlay to have a “voice” within OSAnb. How Victorian indeed! I have made it very clear refutation is open on my site via comments. No one has stepped up to the plate. Otherwise if you don’t like my blog, miss greenjeans Don’t read it. Thanks for the background on the Disraeli quote. I got it from a notepad my mom gave me because I am so self-righteous. 🙂 But I thought it helped my high horse. To be on the board of OSA you have to pay, I am in the non-paying part, the community committee, where you just have to be involved in an activist, journalist or friends group to join. I do not support all the decisions OSA makes, but I am at the table when they are made, and I just don’t want people to think that Stephanie is making all sorts of decisions based on weird things. OSA is certainly not flawless, but they need help, not hate. OSA is still figuring itself and its role out. I do not blindly support all of their actions. I did not go to the ground breaking. But I do want people to understand what’s going on, and be empowered. Maybe my prose style came across as a bit high-falluting. I was a little upset. Really what I want is more participants in our actions (and by our I do not mean only OSA but all local activist groups) and fewer spectators. I want to invite people who are concerned to join the other concerned citizens. It takes a lot of time and money and pushing the government to get anything done, and it is very tiring, but its the way. Most of the volunteers are longtime residents and quite a few 20somethings. We’re not there because we don’t work and are rich, but because we’re not rich and this can be our way of influencing where we live. There are a lot of great ideas on the table in the community and it’s going to take a lot of badgering the government to get them done. We need real help and participation from people. It’s frustrating to have 8 people show up to volunteer and offer ideas and then to read many critiques of , or hear complaints about, what you do. I guess that’s life though. We need ideas there when the decisions are being made, and the floor is open to everyone. With all due respect, Miss Heather. I read your blog frequently and am entertained by it. I love your commentaries on the lives of Greenpointers we meet everyday. I frequent the falafel cart ever since your dispatch on it. I just had to tell you that there isn’t a conspiracy going on. It’s a handful of people trying to figure out the best way, and do something for the community, even if it doesn’t always work out the way we’d all imagined. It’s all good. But we’re going to have to agree to disagree on this one. As for falafel— soon we’re going to being swimming in ’em. Seriously. GreenJeans – I was at the July Community Committee meeting. I supplied my email address at said meeting. I agreed before I left (had to leave at 8:30 to attend a sick dog) to an August meeting. I would not have known about the August 17th meeting you mention above unless I had seen your post at this forum. I walk from “Historic Greenpoint” through McCarren Park to reach the “L” to get to Manhattan 5-7 days per week. I have lived in the nabe for 10 years. I never have seen an OSA Community Council meeting notice/ invite posted. Were it not for my involvement with the dog run at McCarren, I would not have known OSA or the Community Committee or the Steering Council existed. I live in Greenpoint and would love a way to become more involved in the community. Although I agree with Miss Heather about not sleeping with the enemy (so to speak) I would still be very interested in attending community meetings regarding open space and the like. If you tell people about these meetings, greenjeans, they might actually show up with a lot to offer.